Three-way coupling, 250VAC / 16A sealed with protective caps Plug-in connector, Schuko, IP44, 250VAC / 16A. 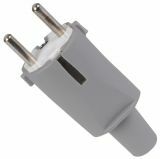 Electrical plug, french, LEGRAND, 50416, 2P+T, 16A, 250VAC, PVC, white Three-pole electricac plug, French type from LEGRAND 2P+T/16A/250V AC, plastic, body in white color and with coated metal pins. 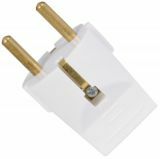 Electrical plug, LEGRAND, 50315, 2P+E,16А, 250VAC, PVC, straight, white Straight schuko 2P+E plug from LEGRAND with maximum current 16 A and white PVC body. 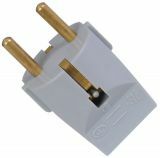 German standard plastic straight outlet. Electrical Schuko Plug, 16A, 250VAC, schuko, bakelite Straight schuko plug with maximum current 16 A and bakelite body. List Price 1.50лв. VAT Incl. 1.42лв. VAT Incl. 1.35лв. VAT Incl. 1.27лв. VAT Incl. Electrical Schuko Plug, 16A, 250VAC, bakelite, grey Straight schuko plug with maximum current 16 A and bakelite body. List Price 2.80лв. VAT Incl. 2.66лв. VAT Incl. 2.52лв. VAT Incl. 2.38лв. VAT Incl. 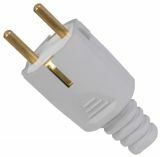 3-pole plug Schuko type, 250VAC, 16A, 90°, PVC, white, rectangular Schuko plug, 250 VAC, 16 A, AC power. List Price 3.80лв. VAT Incl. 3.61лв. VAT Incl. 3.42лв. VAT Incl. 3.23лв. VAT Incl. 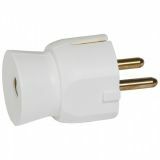 Connector, female, LEGRAND, 50166, 2P, 6А, 230VAC, 1380W, white White, extension female connector from LEGRAND, 2P/6A without earth. It is made of plastic and comes with an extraction ring. White color. Maximum power 1W at 230V. Suitable for home appliances such as bedside lamps. 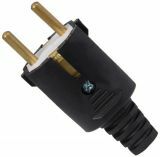 Electrical Schuko Plug, 16A, 250VAC, rubber, black, TODI Straight schuko plug with maximum current 16 A and rubber body. List Price 4.40лв. VAT Incl. 4.18лв. VAT Incl. 3.96лв. VAT Incl. 3.74лв. VAT Incl. 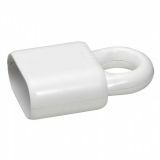 Electrical Schuko Plug, 250VAC, 16А, bakelite, straight, TODI Straight schuko plug made of bakelite in white color to be wired for maximum charge 250VAC/16A. Made in Bulgaria. Power mains connector AC, C19 (J), female plug 16A IEC 60320 network connector, AC power supply, C19 (J), Female plug 16A, 250 VAC. List Price 15.50лв. VAT Incl. 14.72лв. VAT Incl. 13.95лв. VAT Incl. 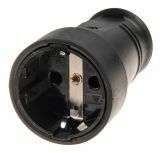 Electrical Schuko Plug, 16 A, 250 VAC Straight schuko plug with maximum current 16 A and PVC body. List Price 4.90лв. VAT Incl. 4.65лв. VAT Incl. 4.41лв. VAT Incl. 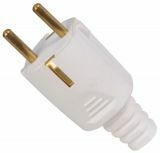 Schuko Plug, 250VAC, 16А, PVC, white, straight, rubber, TODI Straight schuko plug with maximum current 16 A and rubber body. List Price 2.40лв. VAT Incl. 2.28лв. VAT Incl. 2.16лв. VAT Incl. 2.04лв. VAT Incl. Electrical Schuko Plug, 250VAC,16А, PVC, straight, grey, rubber Straight schuko plug with maximum current 16 A and rubber body. List Price 2.50лв. VAT Incl. 2.38лв. VAT Incl. 2.25лв. VAT Incl. 2.13лв. VAT Incl. Electrical Schuko Plug, 220VAC,16А, bakelite, straight Straight schuko plug with maximum current 16 A and bakelite body. 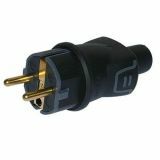 Electrical plug, LEGRAND, 50342, 2P+E, 16А, 230VAC, PVC, rubber, black, straight, IP44, waterproof High quality 2P+E rubber plug LEGRAND 50342 , german standard with nominal current 10A, maximum current 16 A and black PVC body. 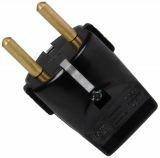 Electrical Schuko Plug, 16A, 250VAC, schuko, rubber Straight schuko power plug with maximum current 16 A and IP44 rubber body. List Price 3.90лв. VAT Incl. 3.70лв. VAT Incl. 3.51лв. VAT Incl. 3.31лв. VAT Incl. Electrical Schuko Plug, 16A/250VAC, schuko, rubber Straight schuko plug with maximum admissible parameters 16 A/250 VAC and rubber corpus. List Price 3.50лв. VAT Incl. 3.32лв. VAT Incl. 3.15лв. VAT Incl. 2.97лв. VAT Incl.